I love finding a good surprise story for my blog. Yesterday, on COCOCOZY Instagram (follow me by clicking here), a reader under the handle @lacqueredlife commented on the multi million dollar home that was the subject of yesterday’s blog post. I replied to her comment and then checked out her Instagram page. When I read she was a preservationist and blogger, I had to check out her website. I found out her name is Olivia Brock, a preservationist, design enthusiast, Charlestonian and creator of Lacquered Life blog. 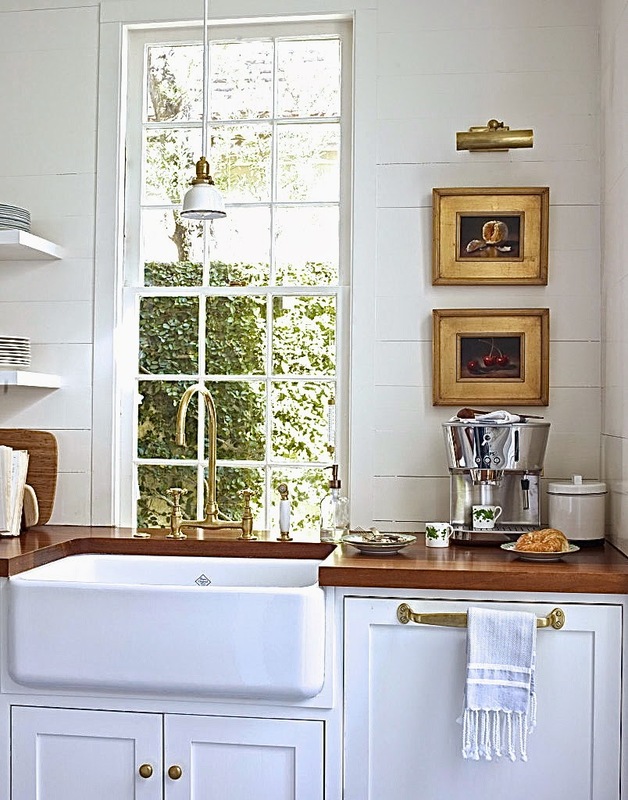 Anyhooooooo, while glancing through her pretty pictures on her blog…I came across the remodel of her kitchen in an old restored one room wide Charleston, South Carolina home that she and her husband share. So many wonderful touches to this new kitchen in an old house. TIP 1 – Lay wood floors on the diagonal – In this kitchen, Olivia and hubby put down new pine floors but laid the boards on a diagonal then painted them a glossy gray. This adds depth and character to the space. TIP 2 – Use butcher block counters – A wood countertop can add warmth to kitchen while also modernizing it. 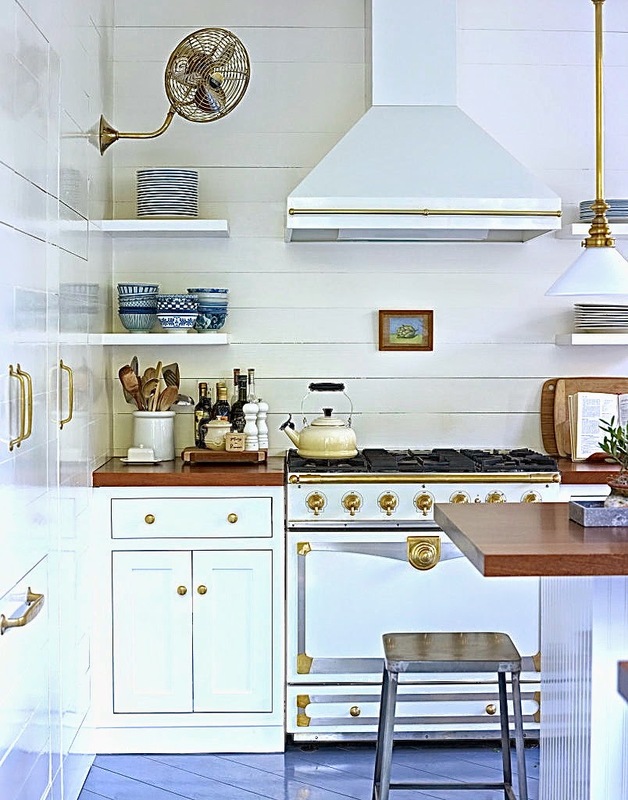 TIP 3 – Pick vintage looking appliances – In this kitchen, the white and brass La Cornue stove looks like it comes from a different century but it is new. Pays homage to the history of the house in a way. 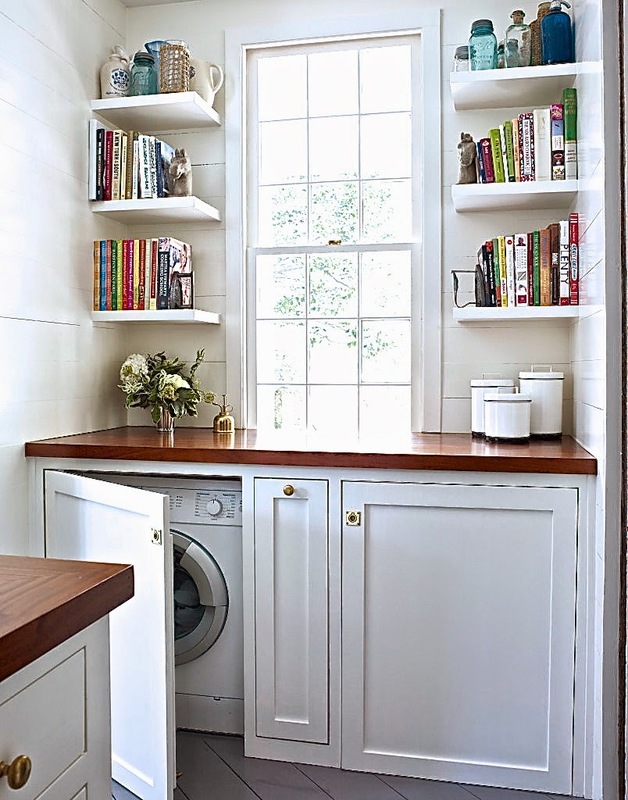 TIP 4 – Be creative with storage – In this case, a corner of the kitchen doubles as the laundry room. Washer and dryer are hidden in a lower cabinet behind pocket doors. 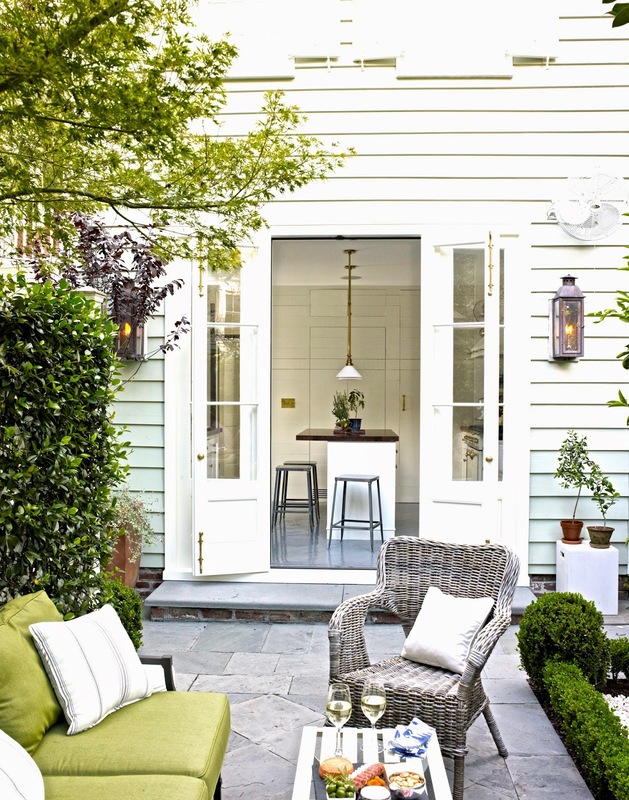 TIP 5 – Indoor outdoor – Make sure your kitchen has some sort of relation to outside – a yard, a patio etc. So nice to be able to fling open a window or French doors and bring the outdoors into the house. Olivia’s house is featured in Southern Living magazine – click here for a full home tour and some before pictures! Beautiful restoration Olivia and beautiful blog! P.S. Yesterday, I went to pick up my little dog Mr. Boo from the klinker (when I am away he stays at my vets office in Beverly Hills). As I walked into the office, a tiny little dog came lurching at me. It must have weighed 4 pounds. The little 4 pounder proceeded to bark at me for the entire 5 minutes I was there waiting for my dog. The owner said the little dog’s name was “Gucci” or something like that…she smiled and said “I am surprised he didn’t attack you when you walked into the door. He’s never been trained and has bad habits”. Then she smiled some more. Well just before Mr. Boo was brought to me, I happened to touch the front door of the office and all of a sudden “Gucci” lurched at me and bit my leg. Now being bit by a 4 pound dog feels like being bit by5 mosquitos in one location – I wasn’t hurt at all but was a little surprised. I looked up at the owner with a bit of shocked look and she was still smiling. She then leaned down and picked up “Gucci”who was still barking furiously and said while smiling still “Oh no. You shouldn’t do that Gucci” Within a minute my super mischievous dog Mr. Boo was brought out…and I thought, “Gucci” is making Mr. Boo look like a saint. Anyway, I guess the moral to this story is…don’t trust small 4 pound dogs named Gucci? Only in Beverly Hills. Right? Nice Post. I get a great idea of conversion of Old to Newer one. Thanks. No apology from Gucci’s owner? Really? 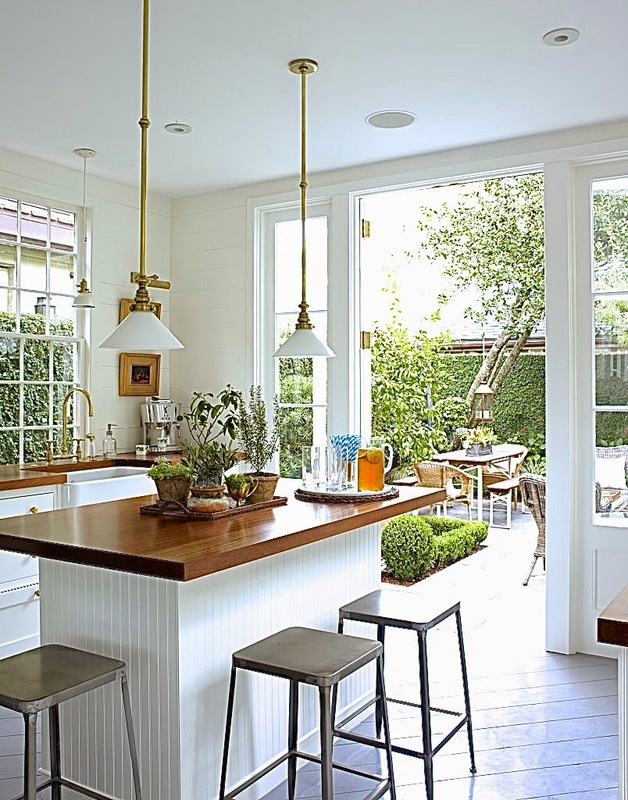 And it seems I’m seeing more butcher block counters…or maybe I am noticing them more. Love this! Finding a great new source of inspiration is so fun. Thanks for sharing. OMG I love her kitchen. Another blog I have to read yeah! I love the diagonal floors. I haven’t seen that before. Good info on kitchen remodeling should be noted! Tip: Mid-height walls would add smart look to your kitchen. Glass displays are also very reflective and striking. Thanks for the tips….nice post. These are great tips for remodeling your kitchen. Laying wood flooring diagonally really does add a unique look. Thanks for the advice! That is interesting that they put the floors in on a diagnal. It makes the space more unique, that’s for sure. I think I like it. I wonder how hard it would be to do it that way ourselves.